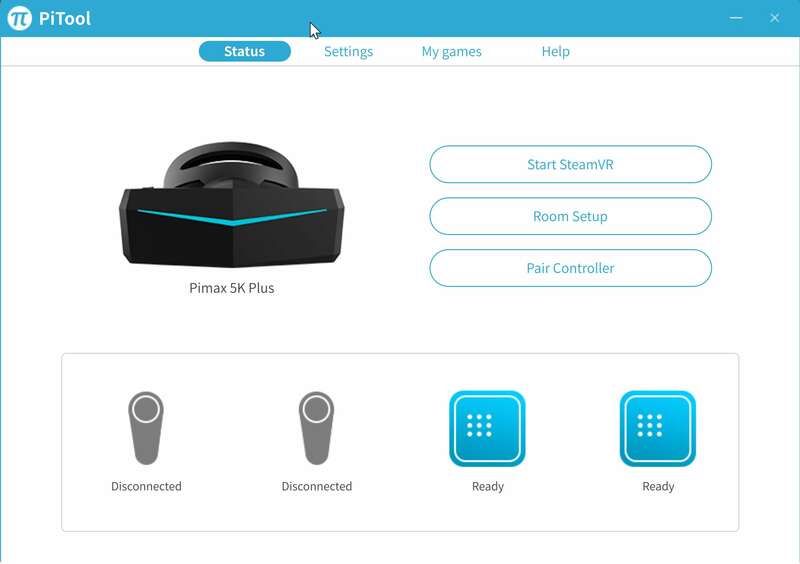 I’m sure you’ll look at PIMAX 5K + review, most of them are still passionate about VR. 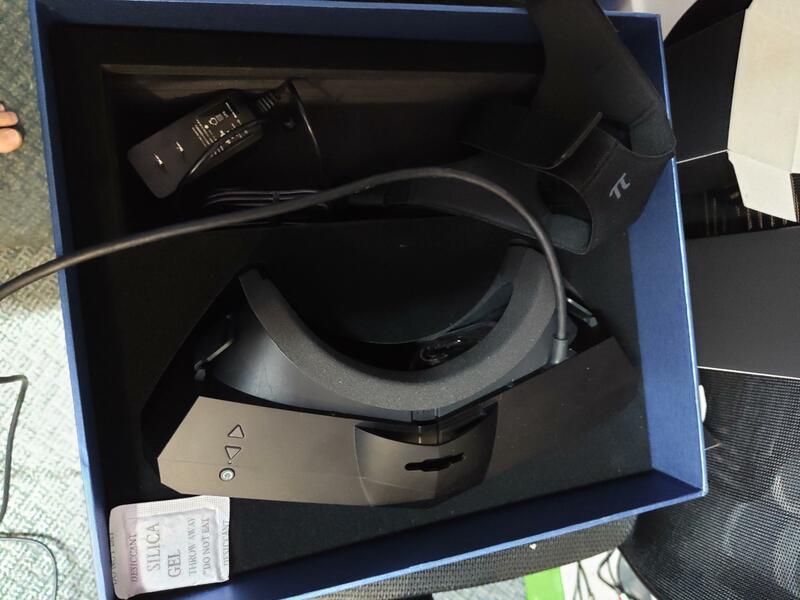 So it’s possible that you may already have VR device on your side. Whether it’s a VIVE OCULUS MR or a phone, simple VR. There must be a question. 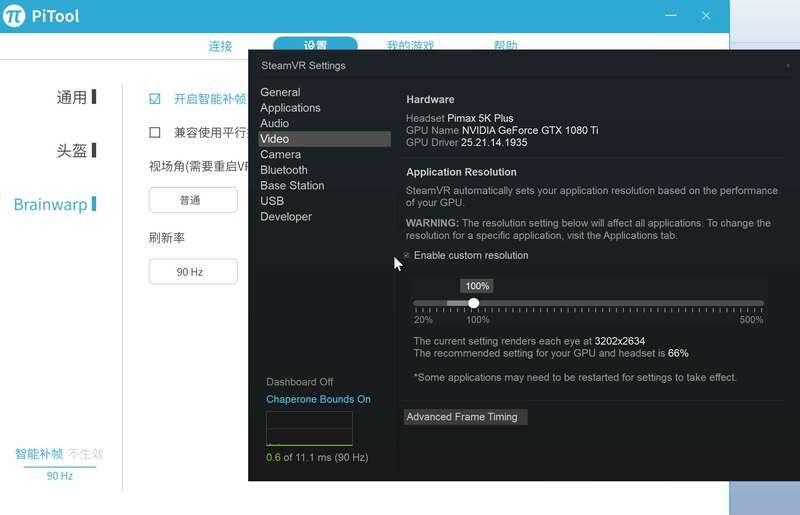 That is, is it worth to spent money buy PIMAX 5K+ or make an upgrade for you old VR device ? I’ll come to a conclusion in advance. it’s worth it. let me tell you why i recommended it. The first point is that it’s about the same or even better as VIVEPRO, so you can barely see the grid, so it’s perfect for looking at the virtual world. 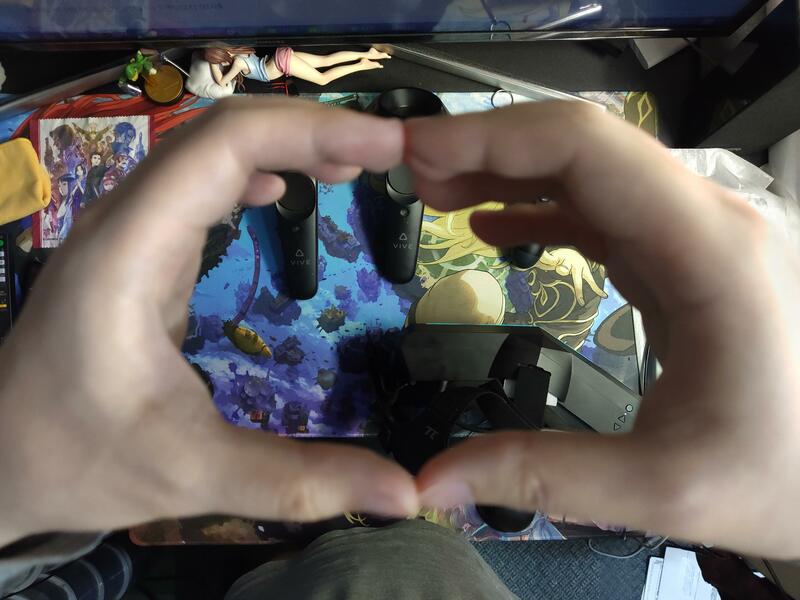 The second point is the 200-degree view angle, and basically what you see is the surface of the game, and there’s no black zone. Compared to VIVE,VIVEPRO, you’ll see the black zone above and down on the left and right when you use it. That’s probably how VIVE and the other VR helmets feel. And the feeling of 5K + please put you hand like picture in front of your eyes . Can only say that there is a big increase in the sense of feeling. You don’t have to look at the virtual world with cursed equipment periscope anymore. That’s the only way to call it a real VR. In addition, with VIRTUAL DESKTOP software, even if it’s used to watch comics, watch movies, or play ordinary games. Because there is no influence of the grid can be very perfect to show the real display like monitor. All I can say is that I don’t even want to use my SAMSUNG43-inch 4KHDR screen in front of me right now, but I want to use PIMAX 5K+ to looking at these visual content. I really enjoyed it with a big screen. Basically, many of the hot games I’ve played are compatible. The common cause of errors is relationship with too high resolution in per eye. 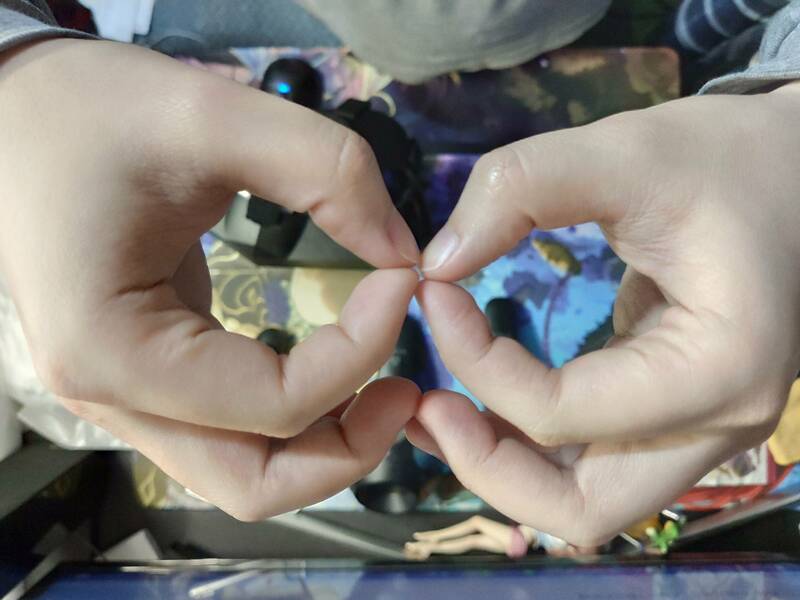 Basically, you can solve it by going to PITOOL to lower your Reder Quality setting. 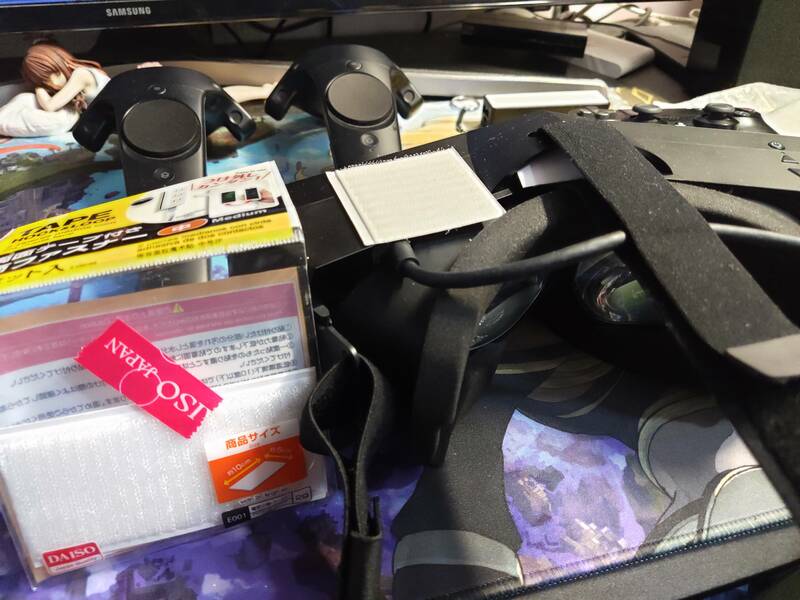 However, the display of the game just like the strongest VIVE PRO level with no periscope. Apart from being amazing, I can’t think of a better adjective. I’m sure no amount of text can help people understand exactly what it is. Here, let’s show you the MI9 ultra-wide angle camera to Make a video, which was sold not long ago. There are straight black in video but when actually using 5k+ it will not appear. The first actual gameplay in The Blu. And then here is the VirtualDesktop display of watching videos and comics. Because the focus problem video is not very clearer,actual display will like the following picture, and it will clearer than the picture. Are you satisfied with the display quality of 5k + and the large angle of view that covers all the viewable ranges? Neither device has a significant increase in the viewing angle, so PIMAX with the largest viewing angle at this moment can be said to be the best choice. So hesitated to spend money, and then it’s going to have to wait a while to get it. All I can say is that the money and the wait will be worth it. What should I do first after receiving 5k +? I got it on April 3rd. Compared with my previous VIVE, the transfer box is a lot simpler. The weight has also been significantly reduced a lot. In addition, the head weared must be installed by you own. This side will first introduce how to deal with it after it is installed, which is better than how to deal with it. When you put it on, you have to put it all together so that the weight depends on wearing it on your head, not on your face. Basically, the most important thing is that the median line will slide if it’s not fixed. The weight will all pressed up on the face by the mask. Go to the store, buy the Velcro, cut off a small piece of face and adjust it to a suitable position to stick to it. So there’s no more sliding up and down. And then adjust your head so that the lower half of the mask doesn’t feel like pressing your face. Then you have to install PITOOL. Added adjustable brightness or eye distance at any time. Basically, after installing the program, if you can not see any display in 5k+. And there are a few special things in the picture that need to be set up. First of all, make sure that 5K + is tracking by LIGHTHOUSE and then start making room setup. Just set the front position for your play and the floor. And then it’s basically ready to use. The uppermost part of a brightness adjustment. I recommend set it to low. Because LED uses the backplane to emit light. Coupled with a Fresnel lens will cause reflection, commonly known as the god ray, which affects the appearance of the display. 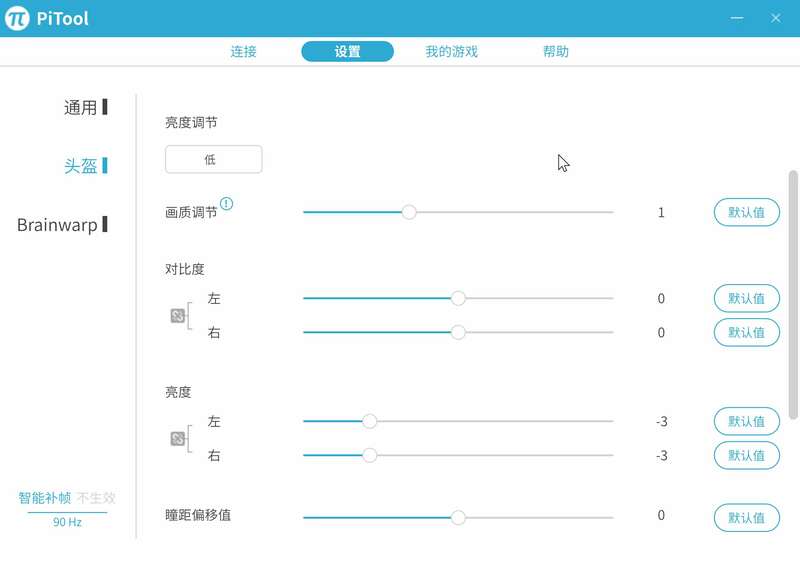 And the contrast and brightness adjustment can be changed at any time. The most important thing is to adjust the render quality, that is, the resolution. Adjust according to your video card. PS: adjustment render quality you must closing STEAMVR first, and modify the PITOOL render quality value then restarted STEAMVR. As shown above, in a normal visual angle, 1 100% of the situation is in a situation of 1 100% of the quality. The resolution of per eye is 32022634. And my display card, 1080TI, is basically can not handle it. 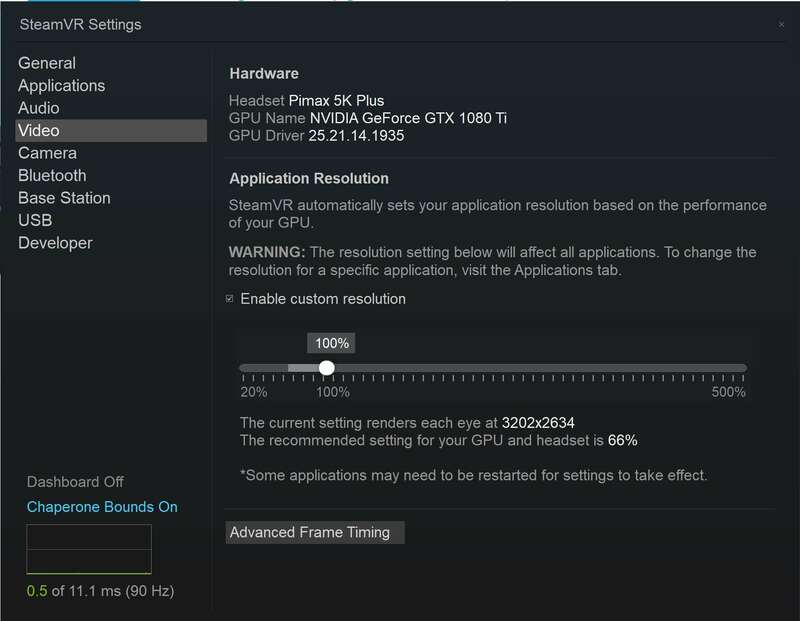 So STEAMVR recommend me change resolution down to 66%, per eye resolution 26012140. Basically, the monocular resolution of 5K + 2560*1440 can be display completely. PS: different field of view will affect the resolution and performance because of increase content in the game will be calculated at the same time. 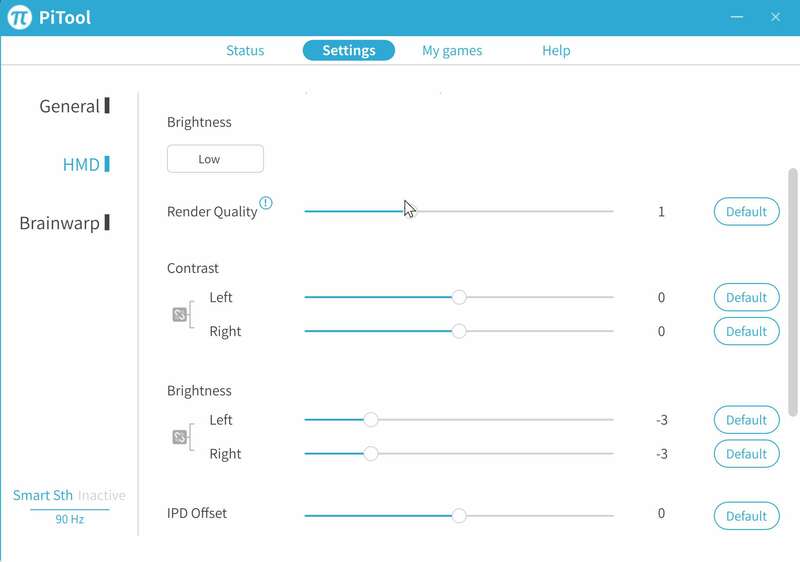 Basically, it will affect the performance of the FPS, so you may need to reduce the resolution of the per eye further. So i recommend uses normal or small field of view. PS:The difference of field of view setting. For example watching movie in the cinema. In normal or small setting. The IMAX film can only see the screen on the left and right, not the border frame. After adjustment field of view to be big. The leftmost and rightmost border can be seen. But what you can see is the same as the 200-degree viewable display with small or normal field of view. PS: saw that there were two display in the display. there was no 3D effect that could not be correctly displayed. Please shut down the game and OCULUS STEAMVR first. And then lower your supersampling value. PS:OCULUS games are usually calculated directly on the basis of the render quality set by PITOOL, so some tours will jump out of the error because of the high per eye resolution. please use PITOOL to change the render quality to 0. 75 or 0. 5 and then start the OCULUS game again. PS:STEAM games you must start STEAMVR from the PITOOL first. 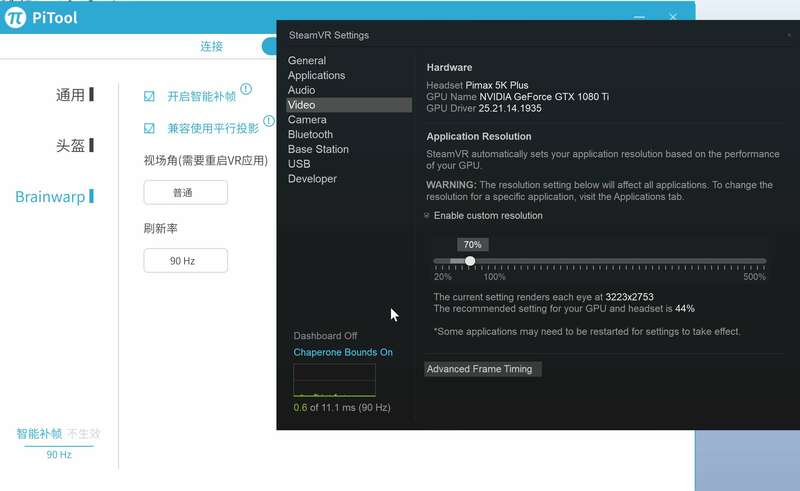 An error occurred in the STEAMVR because of started the game directly. Introduce these basic uses and possible errors. In fact, most of the reason is that the per eye resolution is too high, so you can know how strong the basic resolution of 5K + is. If there’s an unsolvable problem. it’s easy reboot pc and then open pitool again, most of problem can be solved. I hope everyone can enjoy the strong visual impact by the large angle of view and the high quality VR.